Our Infrastructure Management Services practice offers robust, flexible and cost-effective infrastructure solutions. We have unrivaled experience in IT Infrastructure through years of supporting the most complex environments for the leading organizations. Enterprise Computing Services include technologies and services that are typically hosted in Enterprise Data Centers such as server, mainframe, storage, backup, archiving, database, web/app servers and other related technologies. We offer a complete suite of services in Enterprise Computing covering the entire lifecycle of Plan (Consult), Build (Design & Implement), Run (Managed Services) and Monitor (Assess & Report). We also offer Managed Hosting Services from our data centers in North America, Europe and Asia where computing resources are provided on a utility model. 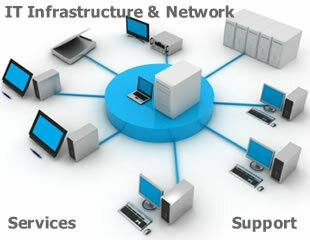 Our Networking Services cover all data, voice and video networking services. With extensive experience in networking services, we offer enterprise customers the ability to monitor and manage all network and voice elements from our 24x7 global network operations center in a truly global delivery model. Our Database Practice offers a wide array of services and solutions that cover the entire spectrum of our client’s database-related requirements spread across the entire database lifecycle. We leverage our expertise and experience to ensure optimization of our client’s database environment irrespective of the stage of lifecycle the Database environment is in. We offers consulting, implementation and management for all infrastructure applications including Enterprise Systems Management and IT Service Management systems. These systems are critical for the day-to-day IT operations of Enterprise Customers and we developed capabilities to support all the leading vendor solutions in this domain. We strongly believe the future of efficient IT operations is dependent on a strong service automation platform and the ability to provide customers with an end-to-end service view. We have invested in a Service Automation Platform and a Service Performance Management Platform to take our enterprise customers to a new level of service management.